Dora is making an irregular pattern shape for a quilt. 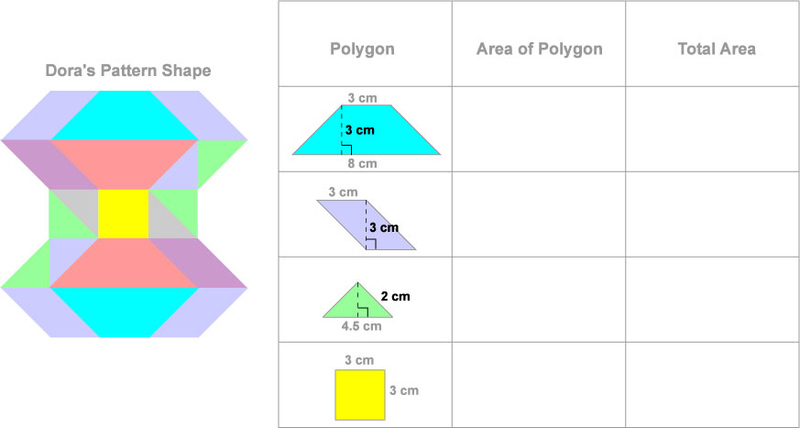 Complete the table to find the total area of this complex shape. What is the area (in cm2) of the trapezoid? What is the area (in cm2) of the parallelogram? What is the area (in cm2) of the triangle? What is the area (in cm2) of the square? How many trapezoids are in Doras pattern block? How many parallelograms are in the pattern block? How many triangles are in the pattern block? What is the total area (in cm2) of all the trapezoids together? What is the total area (in cm2) of all the parallelograms together? What is the total area (in cm2) of all the triangles together? What is the total area (in cm2) of Doras irregular pattern shape?